We had a lot of fun kayaking while in Croatia. It was windy, so kayaking was more of a challenge but doable and fun with the stronger waves. Thankful the instructor was my partner in the double — he knew what he was doing. My group took a break by a cave and swam/snorkeled in the sea, which was beautiful and pleasant. We then kayaked to Lokrum and took a break there as well for a swim/rest prior to returning. All from the group enjoyed the experience. 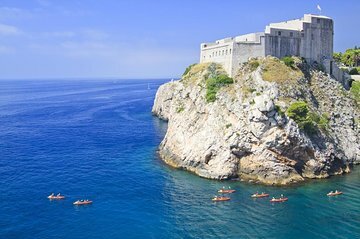 This kayak tour was an excellent choice for our short visit to Dubrovnik. Our tour guide Joseph was amazing and very informative. The company worked around our tight schedule to get back to our cruise ship on time. Great customer service and I highly recommend this tour for your kayak trip! absolutely loved this tour, there was 65 of us in total who booked, we all booked separately but still managed t get on the same tour, the guides were fantastic and the tour itself was brilliant, we started in the old town near restaurant nautika, we set off out to sea and went around the island lokrum, stopped off in a cave before stopping at a beach to have some lunch and the continued around the island back to where we set off. Pack lots of sun cream as you are out at sea for a few hours without any cover, pack some water as well as it is hard work. The tour was a great experience, the views are amazing! But the guides we had were not really friendly and did not make it a fun trip, it was a large group of more than 30 so everything felt rushed, one guide was always being mean to those left behind, rushing them to move faster, we didn't even stop to see the sunset because they kept rushing us. The guides gave water bottles to some and when I asked for mine they were second guessing me if they had already given me some! Like I'm trying to Steal their water. The guides were not helpful and again didn't make an effort to even make effort to make it fun, the younger man giving the actual tour was knowledgeable and funny but it was such a large group, you couldn't even hear him... the wine at the end is just some boxes of wine and crackers thrown in a bag, the guides don't even stay to talk. It's sad because you could see other tours that had guides that really improved the whole trip... im glad the views are so incredible on their own PS: this is not a relaxing kayak tour, this was an intense 2 hour trip kayaking all the time pretty much and with some medium waves and wind, so people should be prepared for a workout. 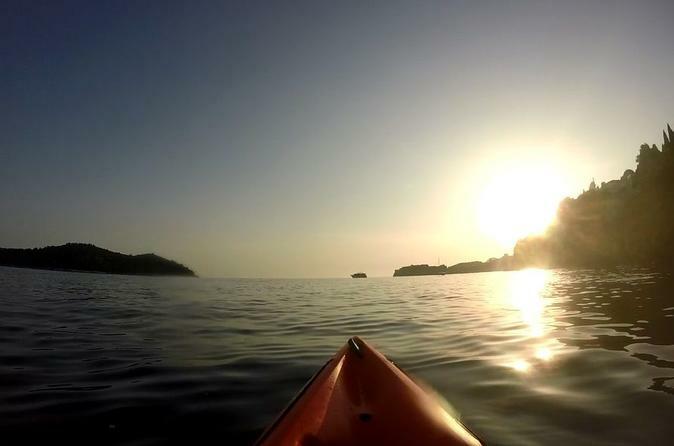 Pros: great to kayak in the Adriatic! Equipment was adequate and in good condition. Great location/ route (around Lokrum island and with a stop in a mainland cave). This tour was great and much smaller than other tours that were out! Would definitely recommend. Very good, love the small group and tour guide had good information. They give you dry packs so you can bring some items with you.